8900 Ethernet interface provides a flexible solution for LAN environments. We are pleased to announce an Ethernet interface for the 8920 / 8930 series printers. Send print jobs from network workstations or servers to its connected printer, freeing file servers and workstations from printing tasks. 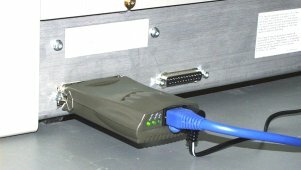 Its IEEE 802.3 Ethernet port and IEEE 1284 parallel interface allow it to connect most Parallel printers directly to an Ethernet based LAN. Ships complete with all the necessary software and drivers to attach to most PC or MAC networks. Protocol support for IPX/SPX, TCP/IP, and NetBEUI are all provided to ensure seamless connection to Windows95, Windows98, WindowsNT, Unix, Novell and other major networking operating systems. PS Admin, a print server administration program, is included, enabling users to conveniently and securely configure and manage from any Windows workstation on the network. Integrated support for Telnet allows the device to be configured from non-Windows based workstations as well. SNMP support allows easy management from popular SNMP based management software programs.